It is replaced by the Janam XP30. The SPT1800 replaces the SPT1700. Twice the processor speed 4-8 8-16 memory configurations Improved display Backup battery Voice over GSM worldwide Non-incendive (non-explosive) - US Class 1 Div 2 ABCD. SPT 1800, Kit. Includes Batch scanner, cradle, power supply and line cord. Interface cable not included. See accessories. 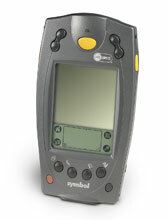 The SPT 1800 of pen-notepad computers offers the most advanced Palm Poweredâ„¢ solution for your work force. 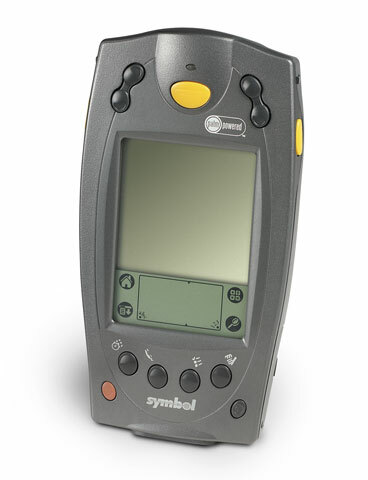 This family of rugged mobile computers combines integrated scanning, sophisticated wireless connectivity and powerful processing capability with the Palm OSÂ® platform. With 1-D barcode data capture and wireless local area network (WLAN) or wireless wide area network (WWAN) communications, the SPT 1800 is a powerful productivity-enhancing tool, serving the multiple needs of today's growing mobile workforce. Tough enough for use in manufacturing and industrial environments, the SPT 1800 enables the Palm OS to perform practically anywhere. The rugged SPT 18XX housing is sealed to IP54 standards for protection against rain and dust, and withstands 4 ft./1.2 m drops to concrete. Symbol's state-of-the-art scan engine with bright, easy to see scan line, delivers premium scanning performance under virtually any lighting conditionâ€“even sunlight or bright artificial light. A high-contrast, anti-reflective liquid crystal display makes data easy to read in low lighting or outdoor conditions. Integrated WLAN or WWAN communication extends the reach of IT resources, enabling real-time information flow between the point of activity and your remote host system, making your business truly mobile. The combination of rugged durability, integrated barcode scanning and wireless communication enables users in a host of industries to capture, compute and communicate data anytime, anywhere. As shipments are unloaded, warehouse management can easily record new inventory levels to networked host systems. Service professionals in hospitality can offer curbside check-in at hotels, and hospital physicians and caregivers can have the latest patient data at hand. Deployment of the SPT 1800 can help increase efficiency and productivity in your business, and a complete line of accessories and peripherals are available to create a total mobile solution. To learn more about the SPT 1800 or any of our innovative products, contact us at any of the locations listed on the back panel or visit us at www.symbol.com/palm.